Witness reports of life inside the camps and detention centres have told not only of unhealthy living conditions but also of regular violence, torture and brainwashing. 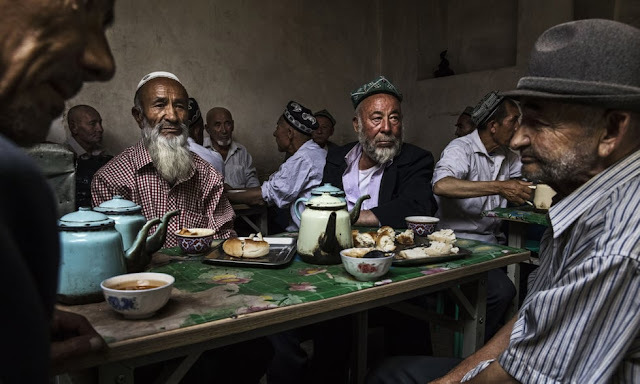 Writing in the New York Times in February, James A Millward, a scholar who has researched Xinjiang for three decades, argued that the “state repression in Xinjiang has never been as severe as it has become since early 2017”. My telling him that I had been kicked out of Kashgar seemed to trigger him, and he would go on to say many things about the situation there, virtually all of them taboo. “Millions of Uighurs” were being held in camps, he told me, where they were being fed 15-year-old leftover rice and subjected to beatings. (Precise numbers are hard to verify, but witness testimonies have confirmed both poor nutrition and violence in the camps.) He said that the Uighurs in this inner-China city now had to attend political meetings, and that they might soon have to take a test on political subjects such as the 19th party congress. Those who didn’t pass would be sent back to Xinjiang. 8-24-2018 But an employee at Toqsun’s Peyshenbe Bazar Police Station confirmed that the township currently maintains three re-education camps--the No. 1 Re-Education Camp, which is located “about 10 kilometers (6.2 miles) outside of the township center;” the No. 2 Re-Education Camp, located “near the township’s depot;” and the Party School Camp. “Approximately 22,000 people,” or more than 11 percent of the population of Toqsun, have been held in the three re-education camps, said the employee, speaking on condition of anonymity. “I heard that a small number of people have been released, but I have never met any,” he added. The employee said that “around 5,000” people are being held at No. 2 Re-Education Camp alone, after being transferred from a now-defunct fourth camp in nearby Tasheriq village, which was formerly a nursing home. He said residents of Peyshenbe Bazar are being sent for detention to No. 1 Re-Education Camp--a three-story building that used to be the township’s No. 1 Middle School. Resettled where? In detention camps, perhaps? Do not censure him who labors daily. Fiery armor protects one from hostile arrows. Iran covert surveillance ship "Saviz"